Well, I did do some work this evening, even though it wasn't a lot. It took a long time though because I am super meticulous about my prep. 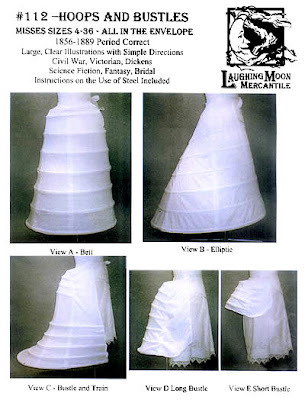 I did pattern prep and cut the pattern pieces out for my bustle cage. I am choosing to make Laughing moon #112 (Hoops and Bustles), view D (shown left). For me, pattern prep takes forever because I have a process that must seem crazy to everyone else. I go through my pattern and cut out the pieces that I will need with excess tissue still left around the edges (I do not cut them on the lines yet). I then fold up every single other piece of tissue very carefully and place them in a one gallon zip-lock bag so as not to loose them. I add in the original package at the front so i can see it for when it is filed back in the pattern box, as well as any parts of the instructions tat do not pertain to what I am making. I then gently iron out the tissue for each piece so they are flat and then iron that onto some freezer paper to get a more rugged pattern piece. Next I cut each part out so it is now just the pattern piece and finally I do one more iron around each one, being specifically attentive to the edges to make sure I have really good adhesion. This pattern also required that I transfer lines for the boning onto the fabric once the pattern was cut out so I did that too. Hopefully tomorrow I will get a chance to start the sewing. It does look fairly straightforward, but there's a lot of hardware in this and it is my first attempt at a cage, so hopefully it won;t take me too long!